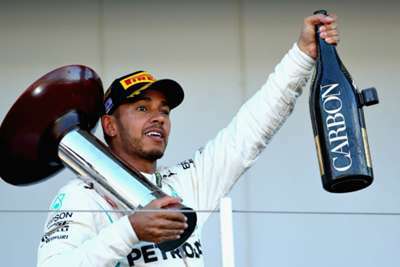 Lewis Hamilton insists he is treating the United States Grand Prix as if it is any other race, despite having the opportunity to potentially clinch the Formula One title in Austin. The defending champion is 67 points clear of nearest challenger Sebastian Vettel heading into the weekend, where a finish of sixth or higher for Hamilton may be enough to secure the drivers' championship. That is not playing on Hamilton's mind, though, as the Mercedes man insists his only goal is to win a fifth consecutive race. "This feels like another race weekend. We want to win. It's a simple goal for us," he told a news conference. "We've just arrived to try to do the same thing. "The weather is up and down - our goal really is just to try to perform as we have in previous races. We're not thinking of it in any other way. "I'm definitely not thinking this weekend about how it's going to feel if I do the job. First, I have to do the job. That adds more pressure and I don't need more pressure." For the second year running, Hamilton has accelerated out of sight in the second half of the season, but he says this has been a common theme throughout his career. "It's probably just a coincidence that it's exactly the same," Hamilton said. "We are improving the car all year long, improving our knowledge of the car and how to get the most out of it. "If we knew what we knew in the second half, we would do it at the beginning. That's just how it is in the sport - that's how it always is. It's been the same since I started in 2007. It's probably the same for everyone. "It's a culmination of so many things. Naturally, as a driver, I've noticed I improve throughout the year, how you conduct yourself, how you perform within the team, how you maximise the car. "If you go back through all the years, you'll notice I've always been saved by the second half of the season. I should be better. Lots of times that's the case. "As a team, we've done a really good job in different areas. The other side have not done such a good job in this second phase." Hamilton has defended rival Vettel in recent weeks, however, and he continued that theme, adding: "If I was in the same position, he would probably do the same thing. "As drivers, we are all members of the GPDA [Grand Prix Drivers' Association] and I think we all need to stick together. The respect we have for one another is probably the greatest it's been for many years. "Ultimately, as a four-time world champion, this is the most intense year that we've had. Every hiccup is magnified, as it is in any sport at the time. "There have been several times that I've been in the firing line. Seb has always been really respectful and supported me. I thought it was only just to do the same."